The recent passing of astronaut Neil Armstrong reminds those of us that lived through the glory days of Projects Mercury, Gemini, and Apollo, of the incredible feats of engineering and the unflappable piloting skill of the astronauts that flew those missions. Our three kids grew up with NASA’s manned-flight space program but I’m not sure our grand kids will learn, in school, much about the history of our space program. It’s hard to believe that we now have to rely on Russian rockets to get our astronauts into space! In a 1962 speech at Rice University, President John F. Kennedy set the goal of landing our NASA astronauts on the moon and returning them safely to Earth before the end of the decade. On July 16, 1969, at 9:32 in the morning, the crew of Apollo 11, Neil Armstrong, Buzz Aldrin, and Mike Collins safely lifted off to meet the goal set by President Kennedy. It was a smooth, problem-free mission up to the time astronauts Armstrong and Aldrin entered the Lunar Excursion Module (LEM) and undocked from the Command module at 100 hours, 12 minutes, zero seconds (100:12:00) into the mission leaving astronaut Mike Collins alone in Columbia, the command module, in lunar orbit. I have always marveled at the coolness Armstrong and Aldrin displayed when the computer program alarms went off during the final minutes of descent. There's Armstrong, as pilot, with one shot to get the fragile, thin-skinned aluminum 'bug', on the lunar surface, faced with a go-no go, life or death decision. Most people don't know or remember the names of Gene Krantz, the flight controller, or Steve Bales the Guidance Officer, or Jack Garman, the young programmer that called ‘Go’ up the line. Even though Neil Armstrong took that “giant step for mankind” he acknowledged the efforts of the thousands of people that put him at the bottom of the LEM ladder, ready to make that ‘one small step”. Steve Bales and Jack Garman are just two of those thousands. Is there a better way for kids or adults to learn about the NASA program that put Neil Armstrong and the other astronauts on the moon than to not only read about the astronauts but to play the role of LEM pilot and experience the thrill of landing on the moon? In the May 2011 post, Do You, Your Kids, or Your Grand Kids Have the Right Stuff?, grand son Joshua is seen flying the free, online version of Lunar Lander available on the web site of the Chabot Space and Science Center. Atari has updated their original pizza parlor arcade Lunar Lander that can be played in the online Atari arcade. It is also available on tablets like the iPad. The two previous Lunar Landers are 2-dimensional, physics-based games. Both are fun and, on the science side, require that the pilot understand that force is a vector quantity that has both a magnitude (size) and a direction. The player will often have to fire a thruster in a direction opposite to the direction of motion to decrease the velocity of the LEM in the direction it’s moving. Point this out to kids. They will intuitively understand what’s going on but may not have the language of science needed to accurately describe events. I know of two Lunar Landers that go well beyond the physics-based game category and into the simulation category that rivals the simulators all the Apollo astronaut LEM pilots used to pratice lunar landings. Both of the following sims take the player into the full, 3-dimensions of space. Both are flown mainly from the ‘inside the LEM’ view because pilots have an instrument panel to monitor. 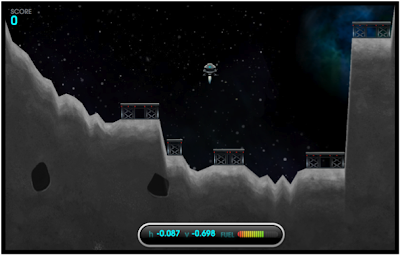 The first 3-D simulation is Lunar Flight, available at WWW.steampowered.com for both the PC and Mac. Here are inside and outside views. A very sophisticated version of Lunar Lander, with a large learning curve, is available at http://www.eaglelander3d.com/. 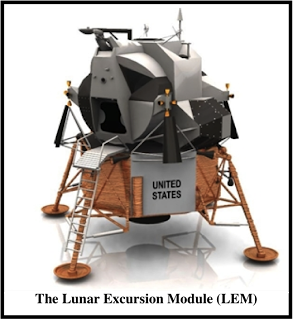 With Eagle Lander, you can actually duplicate Neil Armstrong’s Apollo 11 landing and several more of the Apollo missions. These two pictures will give you an idea of the cockpit detail in the simulation. The switches and instruments seen in the pictures (and many more not seen) are active, that is, they work. Grand sons Joshua, John, and Andrew are already flying missions in Lunar Flight and, if they are interested, will have the opportunity to fly the Eagle Lander 3D with dads and grand dad. To close, it is my hope, that during my grand kids lives, another national leader with the vision of John Fitzgerald Kennedy comes along and challenges all Americans to reach beyond the moon to even greater accomplishments.